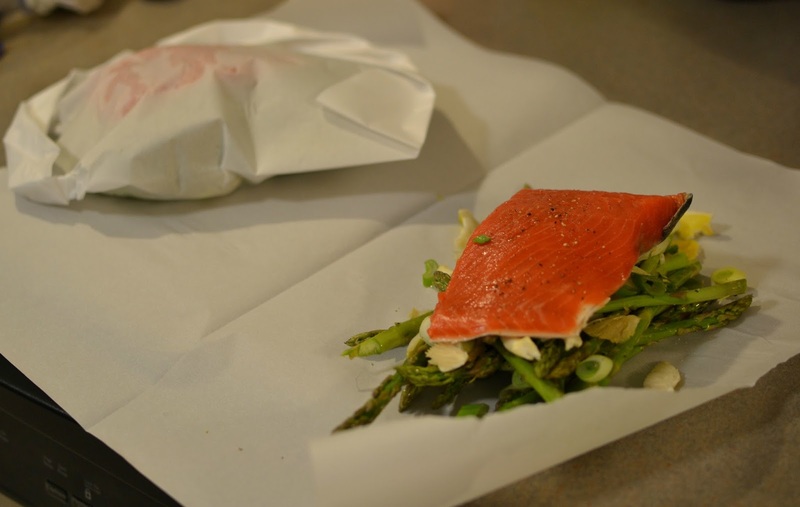 Baking fish in parchment is a great way to prepare fish and make it flavorful. The fish really takes on whatever else you nestle it in parchment with (so don't make it bland). We've done fish in parchment just once before and that used lemon, fresh herbs, a bay leaf, and wine as the flavoring components. This recipe not only includes the flavoring components for the fish but also some veggies to serve with it! This fish in parchment was definitely a winner! We will be making it again. Hope you try it. Preheat oven to 400 degrees with racks in upper and lower thirds. Cut four 12-by-17-inch pieces of parchment. Fold each in half crosswise to make a crease, then unfold and lay flat. Toss mushrooms, asparagus, and scallions with oil in a large bowl. Sprinkle with lemon zest and season with salt and pepper. Remove asparagus from mixture and divide evenly among parchment pieces, creating a bed of spears on 1 side of crease. Top each with 1 piece of fish, then with mushroom mixture. Drizzle each serving with 1 tablespoon water. To close, fold parchment pieces over each serving; make small overlapping pleats to seal the open sides and create 4 half-moon-shaped packets. Bake packets on 2 baking sheets 9 minutes. Carefully cut open packets with kitchen shears (steam will be released). Serve fish, asparagus, and mushrooms with lemon wedges for squeezing. We served with a side of sun-dried tomato couscous. This does sound easy and good.